Twin sisters, Robin and Sarah, with sordid pasts have a falling out and don't speak for years. Circumstances put them back in each other's lives and as their pasts catch up with them, they learn things about each other they never expected. Their past experiences turn Robin into a recluse.. not having left her home in years, she spends her time working out and spying on her neighbors. Sarah, the older twin, is ostracized from her husband and has her daughter, Violet, taken from her. Her only hope is to find her sister for some support to get her family back. The book propels us in alternating chapters through each of their perspectives from past to present. A story of how the effects from their childhoods propel them into their future selves. How every layer of their lives build into a world so deceptive, they're not even sure what's happening. Parents, pay attention and understand your actions always affect your children. Children, do as they say (sometimes) and not as they do! Definitely a character driven novel, I felt more for Callum than I did for any of the other characters. Psychologically, just about every character has issues. Touching on broken and blended families, physical and mental abuse, twin love and how all actions are felt by everyone around you, the author takes you right into the psyche of child to adult. 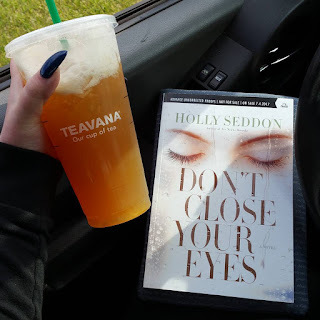 I wasn't sure where the novel was heading toward for most of the book, but I couldn't stop reading as I needed to know how Holly was going to bring everything together. That ending certainly took me by surprise and the last 15-20% really brought everything two fold. July is another month full of upcoming psychological thrillers! 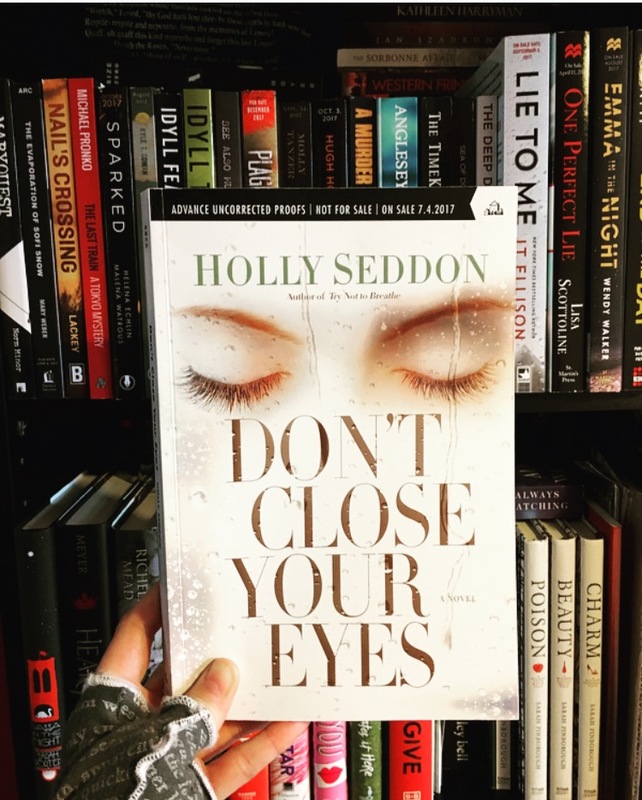 DONT CLOSE YOUR EYES by Holly Seddon is one of those more anticipated ones. We follow twin sisters, Robin and Sarah, they haven't spoken in years, but when Sarah turns up on Robin's doorstep, all their secrets from their past begin to catch up with them. Robin and Sarah are twin sisters that lead very different lives. Sarah's husband has kicked her out and won't allow her to see her child. Her past is catching up to her and so are her dark secrets - but she will not lose her daughter - so Sarah goes looking for her sister. Robin is a complete shut in, but her new hobby is spying on her neighbors and meddling with their lives in subtle ways. 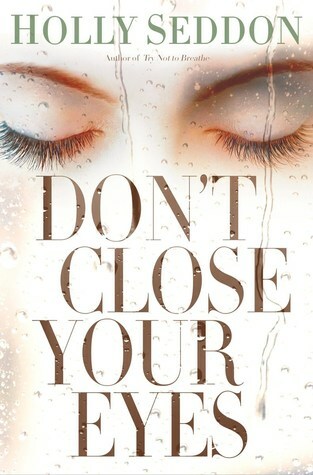 Her world is flipped upside down when someone from her past comes back into her life. The story is told in the alternating perspectives of Robin and Sarah - it also jumps from childhood flashbacks to present day. Back in their childhood, the girls made a new friend at school, Callum. The two families get along great until deception tears them apart. The girls are separated - one off to England with their father and the other to the United States with their mother. 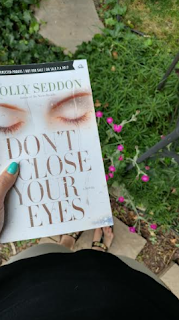 Holly Seddon did an incredible job weaving such an intricate story. The short chapters and switching perspectives helps keep the pace throughout the book. Robin and Sarah's childhood is full of secrets, lies, and they are constantly enduring misfortunes. How does Callum fit into all of this? Well, you better start reading to find out! This was a great domestic and psychological thriller. Seddon perfectly captures family dysfunction and how the effects carry on into adulthood. These characters are so well developed and complex - you love them, you want to know more about them. She laid out the story in a way that made you keep turning the pages, and with the short chapters I found myself constantly saying, "Just one more!". If you want a good psychological and domestic thriller with one hell of a twist, then I'd highly recommend this one! 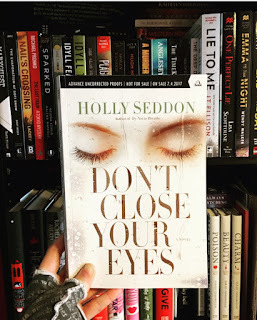 Don’t Close Your Eyes, the sophmore novel by Holly Seddon, was a book I was very much looking forward too. Twin sisters, torn apart by a family secret, are driven back together after one is forced to leave her family and the other is struggling to face her past demons. There were lots of things I loved about this book; it has extremely short chapters moving back and forth between time periods and narrators. Both twins get their POVs shown and I felt like this type of narration made the text very dynamic. I was absolutely glued trying to figure out their individual MO’s and where their stories would intertwine. I really liked the complex characterization in this one; filled with a twisted family dynamic, I loved watching them interact. However, my major complaint was that I felt this book was mismarketed. I wouldn’t categorize this as a mystery, psychological suspense or a thriller. I would say it is contemporary fiction. Was it well written? Absolutely. Did I feel compelled to finish the book? Absolutely. Was it what I was expecting, or for that matter, anywhere close to what I was expecting? No. Aside from one moment in the text, right near the end, I did not find there to be any shocks or twists. If you are looking for a psychological thriller to leave you breathless, this will not be the one for you. However, if you enjoy a character driven narrative that is well written and intriguing, then this may be the perfect pick for you. I, for one, gave this a 2.5/5 stars. Big thank you to Ballantine Books / Random House for these copies in return for our honest opinions.